"... she is turning base knitters into golden crocheters -crafting alchemy at its finest." "You have created a masterpiece." "... learnt so much. Even remembered the stitches when I got home." " ... Irene's ruffled coral towers ... are among the most ingenious reef creations." "There is probably nothing as cosy as these days in existence..."
Check out my pictures on Instagram where I occasionally drop pictures of varying quality and content! My deepest thanks to all who have sent kind words and messages of sympathy on the recent passing of my wife, friend, partner and collaborator Irene Lundgaard. Irene and I spent twenty wonderful years together and it was a privilege to live with such a creative, kind-hearted and beautiful human being, she truly was a force of nature. To say that Irene could brighten up any room that she walked into would be an understatement as I am sure anyone who knew her would testify and her loss is immeasurable, she will be forever in my heart. Over the last few months I have been on a mission inspired by the Motorbike Doily I made last year for my brother Thue. I do not crochet doilies, I do not use doilies but I love the time-consuming work that the fine cotton thread offers and the fine delicate work one can churn out, so I set to work on some more for my other siblings. First I made an Oil Rig & Supply Ship Doily – it was done in the same technique as the Motorbike Doily, in fine thread (80 on a 0.6 mm hook). I wanted to make this for my oil rig brother Jens and even managed to create a few waves for him on it around the supply ship. I loved making it, and I dug out my great granny’s sampler book for the edgings and was quite true to her handicraft from the 1890s as I copied her pretty edge ideas! There is a wonderful connected-ness to my way back crochet background when I look in that book. The next person on my list was my sister Tina and I also wanted to make her something meaningful. She lives in London and has a deep love for the obsolete Routemaster buses that used to bring the masses around in the streets of London. Fortunately, some of these old buses are still in operation, one such bus is the number 9 heritage bus that goes to Trafalgar, to me and to my sister, it doesn’t get any more London than that, so my choice of image was quickly decided. I had run out of the very fine thread so I upped the thread to a 40 on a 1.0 mm hook. Yet again, I tipped my crochet toes into my great granny’s sampler book for the edging but this time around I elaborated on her originals and some of the ideas I came up with might just work as nice edges on some simple crochet woollen winter shawls. Only time will tell and perhaps my stash, my hook and my imagination – we’ll see! Anyway, this is the Routemaster bus doily I crochet. What fun I had! Finally my brother Leif was on the receiving end of a doily. He and I both share the love of picking fossils on the shore. We all grew up on a rather unique island called Fur in Denmark which is riddled with the most fascinating fossils and geology of interesting Diatomite Cliffs (moclay). When he and I walk on the beach we see nothing of the view as we have our noses stuck into the gravel under foot and prize out the treasures fossilized sea urchins, octopuses, oysters, wood – whatever fossil we can find from at least 50 million years ago. I made Leif a fossilized sea urchin with a lighthouse in the background to set the maritime scene. I elaborated even further on the edges from the Routemaster doily and there is no doubt in my mind that some of these will indeed turn into some edging on simple crochet shawls for the winter. This is the Fossil & Lighthouse doily – I’m glad ancient fossils are never strictly symmetric! Giggle! I have a few more ideas like these up the sleeve, as a matter of fact, I have already stared two so there is no dilly-dally here, only doilies! I have a few balls of DMC 80 cotton and thought I’d use it for a birthday present, so I set to work with pencil and notepad. I had a few ideas and landed on working in Filet Crochet, a technique I very rarely use as it does not really appeal to me, but my plan of making a wall hanging of sorts with some ancient rune writing made me fall back to Filet Crochet. I had thought of freeform – something like the motorbike from last summer, but that didn’t appeal either, so Filet Crochet it is! This is where I have gotten so far. I am working on my size 0.75 mm hook and the cotton thread is DMC 80 in Ecru. Soon the main crochet will be done, then I will add some frilly edges and once that is all done, a good blocking will make it possible to actually read the runes, although that obviously will require knowledge of the ancient script of runes. Runes are an old Norse alphabet used by the Vikings among many others. I have always been struck by the beauty of this old script. If you are curious, you can read about runes here. Once the crochet is completed I will write about the actual writing on this piece which is also ancient and something that has followed me as a thing of beauty since my childhood. Soon Sct Patrick’s Day will be here, on March 17th to be exact and I know many have their hook out to celebrate. Last year I made this free Shamrock pattern available and I just thought I would remind you that it is still available. All you need to get the pattern is to click here! Sit down and celebrate that spring is on the verge of being sprung while using your crochet hook and go out on the day and celebrate with your pretty home made shamrocks draped around your neck. Enjoy! Last year I was inspired to making a Halloween Web Crochet Pattern and this year I am inspired too as I am currently developing some crochet bats for the trees in the garden that will go just nicely with the webs of last year. I’m nearly there with the bats but until I’m right there with them, I thought I would share the webs from last year first! The pattern for the webs, is simple and worked in an acrylic yarn in a DK weight on a 4mm/G hook. I was able to make 5 webs out of 50 grams, so each one doesn’t take an awful lot of yarn and they can be worked in any yarn you like. I chose acrylic for added horridness in the making and not least because it’s often easier to get scary colours in acrylic yarn. The pattern is available in both UK and US terminology right here if you would like some for your own garden. Once you buy the pattern it will be sent to you by E-mail as a PDF-file ready to print. It will be sent to you within 24 hours of your purchase. This weekend saw Pia & Thue’s 40th birthday and I celebrated with a spot of crochet – the ultimate from of celebration if you ask me. Pia & Thue are avid bikers, this summer saw them “do Sweden” on their bikes and next year they are planning a very long bike trip in America… What could I do but crochet them a motorbike doily to celebrate? Note: I used Ecru DMC 100 and a 0.75 mm crochet hook. A while back I lost my 8mm crochet hook. Well, perhaps I didn’t quite lose it, but it’s missing and I haven’t ordered a replacement for various reasons, one of them being that I am mainly working on my 2 mm hook at the moment. Donal made me this lovely tune and video to go with it and designed the 3D hook which he animated and all. When I saw the hook he had designed I fell in love. I thought it looked very cute although I wasn’t sure how practical it would be. Donal has been toying with 3D printing for a while and asked me if I would like a new crochet hook. I immediately said yes and got him to make me an 8mm hook. We worked a bit on the shape and what fun we had working it out. Today was the day the hook arrived. Great excitement! TADAAAAAAAA! The hook came well wrapped and placed in a plastic bag. This is the first ever 3D printing done in this house and we loved it, unfortunately, it turned out that the material was not smooth but had a rough surface making it a wee bit testing to crochet with. A bit of a rough surface was not going to stop me from working with the hook which was so lovingly made for me. Out came the yarn and off I went. There are a couple of adjustments needed to the design of the hook, but honestly, I will love this hook to bits! It was made with love and care! Perhaps we will be able to change the few bits that needs changing and giving it another go but with a smooth surface. In the meantime, I think a whirl with the emery board might improve matters… One way or another, I love that hook! I’m on a roll with these summer neck pieces. I like the simplicity of the grey linen and silver coloured beads – once we get the sun and a bit of a tan I think it’ll look great on some summer skin! I have a bag of delicious Mulberry Silk, I have been stroking the cones for a good while wondering what to use these goodies for. Yesterday I completed this curry coloured piece and started a bright red one immediately after which I hope to have done later in the week. Mulberry Silk is quite addictive and the colours are just so rich and delicious! It is the most delicious yarn ever. Probably! It’s delicious to touch, it drapes elegantly, the colours are gorgeous. Just fabulous! Note: These necklaces are for sale in the Deirdre Minogue Sale Shop in Tinahely, Co Wicklow, Ireland. The shop is open Friday and Saturday from 11 to 5. I don’t know where this romantic streak of mine has come from of late! First there was pink crochet flowers, then crochet with pearl beads and now doilies for the hair! It must be that spring has sprung! I have had my DMC 40 pure cotton Ecru coloured thread out along with my .6 mm crochet hook. I love delicate work like that! I always have. The finer the better. What rolled off the hook was a little hair decoration or fascinator of sorts, I think it’s so quaint and would go well with a lot of the Renaissance style hair up-dos I see around. Pretty, romantic and totally cutting edge science hyperboles with a twist. I like the quirkiness of that! I need a wig to show it off properly. My own hair won’t work for this colour, fortunately a friends of mine have wigs about the house, so I’ll go visit soon for some proper pictures. Note: I am going to make more of this style of hair decorations. They will be on sale in Deirdre Minogue’s Shop in Tinahely, Co Wicklow, where I will be working every Friday instead of Saturday for the next few weeks. Hope to see you there! I love the fashion of statement jewellery, I have seen very many beautiful pieces but I rarely wear any myself as my neck does not like the weight, not even a fine little gold necklace with a small pendant does my neck like. However, I am a great woman for wearing scarves, my neck really like them but I find them a bit heavy for the spring and summer so over the last few weeks I have been playing with my hook to try and make a pared down version of a summer scarf. These two pieces are for sale in the Deirdre Minogue Shop in Tinahely, Co Wicklow. I have made my love of yarn and sense of fun an active part of my life by giving classes in what I master: Classical Crochet, including Granny Squares, Lace, Amigurumi as well as Tapestry Crochet, Freeform Crochet and Tunisian Crochet. Best practice, pattern/chart reading and good finishing are always included in my tuition as well as how to avoid repetitive strains, achieve beautiful drape in the fabric you are making and not least, all the handy tricks of the trade. I give one to one tuition as well as tailoring classes for groups. You can check out the Bookings tab on the site for details on current available classes. I also teach Continental and Fair Isle style knitting. of my patterns or would like me to tailor a workshop. Click play and listen to music while you browse my website. I was delighted to supply crochet props for the movie Astérix & Obélix: God Save Britannia. You can read about the process and the pretty props here and here. I was privileged to work the Dublin incarnation of the Blue Morph hat by Victoria Vesna at Science Gallery, Dublin in October 2012. You can find my posts about the journey and exhibition here. The Irish Reef is currently exhibited at The Greenhouse, 17 Andrews Street, Dublin 2 where it will be on display until late 2011. We are also looking for other places to exhibit The Irish Reef which is a satellite of the worldwide Hyperbolic Crochet Coral Reef Project created by Margaret and Christine Wertheim of the Institute For Figuring in Los Angeles. The Irish Reef was brought into being under the auspices of the Science Gallery, an initiative of Trinity College Dublin. Visit www.crochetcoralreef.org for much more detail. 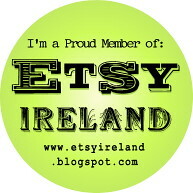 Check out all my posts on The Irish Hyperbolic Crochet Coral Reef here! Note: Drop me a mail if you are interested in exhibiting The Irish Reef. and follow the fun adventures of the Tinahely Arts Group of which I am a happy member. This is a Flickr badge showing items in a set called Knitting 'n that. Make your own badge here. All text and pictures are mine unless otherwise stated. The entire content of this page may therefore not be used without my written permission. You are welcome to link to my page.